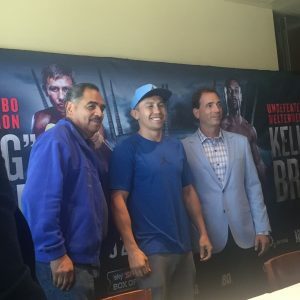 At first K2 Promotions’ Tom Loeffler list of opponents for unified middleweight champion Gennady Golovkin was a short one with the name Canelo Alvarez at the top. However, this is boxing and sometimes your initial plan isn’t going to work as was the case for Golovkin’s September fight date. That didn’t get far either, but (IBF) welterweight champion Kell Brook jumped at the opportunity. In the ironic state that sometimes is boxing, the welterweight champion is jumping up to face Golovkin, Sept. 10 at the O2 Arena in London. The fight will be carried on HBO. This entry was posted in Inside Boxing blog and tagged Gennady Golovkin, Kell Brook by Damian Calhoun. Bookmark the permalink.